Orville Gibson invented the carved-top guitar in the 1890s. The Gibson company refined the design with the addition of f-holes in 1922, and brought the concept to full potential in the mid ’30s with larger-bodied archtops. • While Gibson inarguably blazed the trail in the industry when it came to archtop design, that trail had at least one wrong turn, exemplified by this month’s featured guitar – essentially an f-hole version of the company’s 133/4″ roundhole archtop L-3. From a historical perspective – the perspective of someone in 1930 looking back at earlier Gibsons – this guitar would seem a great idea. In Gibson’s first catalog, published shortly after the company was formed in October, 1902, all seven guitar models were offered in several body widths – 121/2″, 131/2″ and (except for the L-1) 16″. The surviving models quickly settled into standard sizes of 131/2″ for the round-hole L-1 and L-3, and 16″ for the roundhole L-4 and the oval-hole Style O. In the early 1900s, a 131/2″ guitar was not considered small. Martin’s size 0, for example, was 131/2″ wide and was in the middle of the range. A Gibson L-1 or L-3 was adequate for the way Gibson marketed guitars, as accompaniment instruments in mandolin groups. While professional guitarists gravitated to the larger and louder L-4 or Style O, the L-1 and L-3 were still mainstays of Gibson’s archtop line at the beginning of the 1920s. Somewhere along the way, the L-3 grew slightly, to a catalog spec of 139/16″ and to an actual size of 133/4″. With the guitar growing in popularity, Gibson discontinued the L-1 in 1925, replacing it in ’26 with a pair of flat-tops – the L-1 and the L-0 – which used the same body size and shape with a circular lower bout. The L-3 continued through the ’20s. Gibson tried to elevate its status by changing the round soundhole to an oval hole circa ’27, but by the end of the decade it was clearly a model from a bygone era. In the meantime, Gibson acoustic engineer Lloyd Loar had devised a new archtop design that used violin-style f-holes. The “star” of the new Style 5 line was the F-5 mandolin, but Loar extended the f-hole concept across the mandolin family, which in Gibson’s view included the guitar. 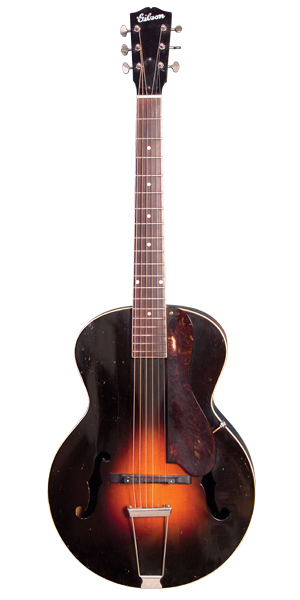 The L-5, a 16″ archtop with f-holes, made its debut in ’22. The f-hole archtop was not an instant success, but by the late ’20s, guitarists began to discover the cutting rhythmic power of the f-hole design. For many guitarists, the only problem with the L-5 was its price. At $275, it was almost double the price of the roundhole L-4 at $150. In ’29, a new model called the L-10 appeared, sporting the same 16″ body and f-holes as the L-5, but with a black finish that made it more affordable. When it finally appeared on a price list in November, 1931, it came in at $175. At the same time, as evidence of changing preferences among guitarists, Gibson dropped the L-4 to $100. In order to extend the f-hole archtop line downward to an even less expensive – and, hopefully, better-selling model – Gibson would have to make a smaller guitar. The next size down was 133/4″, which Gibson was still producing in the form of the L-3. In a last-ditch attempt to maintain interest in the model, Gibson had just fitted it with the elevated fingerboard extension found on the L-5 and L-10. Curiously, Gibson was well along in the process of moving its flat-top line upward in size, from 131/2″ to 143/4″. In addition, Gibson introduced an even larger flat-top – the 16″ HG-24, an oddball with a round hole plus four f-holes in the top, as well as an inner baffle. Although Gibson wouldn’t “advance” the size of its archtops until ’35, the movement toward larger, louder acoustic guitars was clearly recognized by Gibson and underway by 1930. In addition to the f-holes, this guitar is distinguished from almost all L-3s by the fingerboard extension, which is elevated off the top. The L-3’s fingerboard was flush with the top except in ’32, its last year of production, when it received the elevated fingerboard – a feature found only on the f-hole models. Whether this guitar was a custom order or a factory experiment is immaterial. In the context of an ever-growing demand for louder guitars, a smaller f-hole archtop was a step in the wrong direction. And Gibson apparently recognized it as such. The company’s next archtop was another 16″ f-hole model, the L-12. In ’32, Gibson finally introduced a smaller, more economical archtop. Ironically, its model number, L-50, might have suggested a higher-quality guitar than the existing models, but it ushered in a new era of Gibson model names that corresponded to list prices. It had an odd body shape, with a width of 143/4″ and a length of 171/2″ – almost two inches shorter than the 143/4″ flat-tops – which gave it a squat look. The standard specification called for a round soundhole, though a few were made with f-holes. Within two years, Gibson would lengthen the body, at which point f-holes became standard. 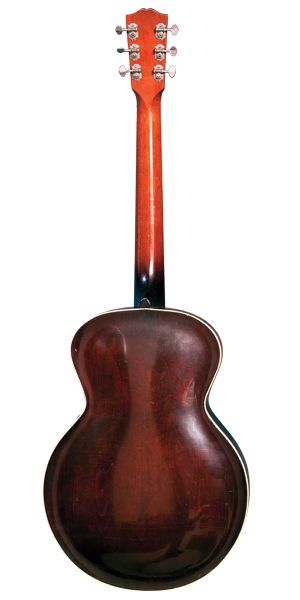 In 1935, when all Gibson archtops “advanced” a step, the L-50 went to 16″. Gibson filled the vacated spot with a pair of cheaper 143/4″ f-hole models, the L-30 and L-37, priced at $30 and $37.50 respectively. Although Gibson’s primary competitor in the archtop market, Epiphone, was moderately successful in the early ’30s with its 13″ Olympic model, Gibson never again ventured below 143/4″ when it came to f-hole arch tops.